Today’s annual Summer photo shoot for the Dutch Royal Family has been cancelled. Instead of smiles, the royals swap poses for a somber day mourning with the rest of the world the loss of those aboard the flight that was shot down yesterday, killing all 295 passengers and crew. The flight originated out of Amsterdam, meaning there was a large amount of Dutch nationals aboard, at least 173. “I am deeply saddened by the terrible news about the crash of flight MH17 over Ukrainian territory. 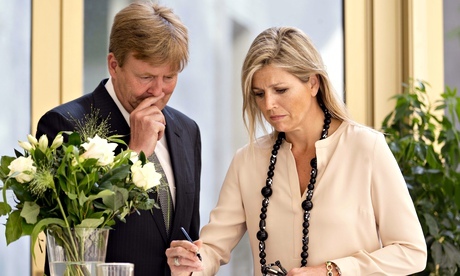 Like the rest of the Netherlands my wife and I follow the news closely and we hope that soon more becomes clear. Other Royals, including Belgian, and British, have expressed their condolences, as well. You know what is nice about these two? They haven’t developed the royal stone face. They are in touch with their emotions, and they show what they are feeling. Good for them! I am tired of the traditional royal look of bland indigestion. This is more appropriate and fitting.